Student loan debt crossed the trillion-dollar mark in 2014, becoming the second largest sector of household debt behind mortgages. Two-thirds of college graduates leave school with student loan debt. Parents want their children to enjoy a lifestyle greater than their own, so what can you do to make sure that happens? One answer may surprise you – pay YOU first. The 529 plan is arguably the most common tool used to save for college. The tax savings (you’re not taxed on the account’s growth) are appealing, but these plans can also present challenges. Limited investment options. 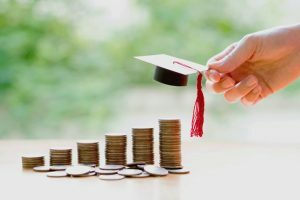 According to Investment News, the number one college savings plan with more than $44 billion in aggregate funds is the American Funds 529 Plan, which offers a defined line up of mutual fund choices. But, you can only choose from American Funds! Other restrictions include a lack of portfolio flexibility and lack of flexibility across a greater mutual fund spectrum. Since 2009, we experienced an extended bull market run that, by some measures, is the fourth longest in U.S. history. While the stock market has continued to go up year after year, funds that hold stocks at all times will go up as well. At the same time, interest rates generally have fallen since epic highs in the early 1980s – again, not a problem for bond based investments. However, if the stock market doesn’t perform well and interest rates go up – what does that mean for regular stock and bond funds? Generic mutual fund investments are limited in what they can do to stave off difficult economic conditions and a subsequent poor performance. These limitations would have investors anxious to find alternatives outside the typical “long only” stock funds and leveraged bond funds that could experience different portfolio results in challenging market conditions. Expensive fees. Fees can include the investment company, the state covering the plan, mutual fund fees and expenses and investment advisor costs, if you work with one. It’s not uncommon to see a total fee structure of 1.5% to 2% per year on the total dollars invested. You may also have paid a sales load to get into the fund, which could increase your cost to get out or access some of the money. Most people don’t manage their investments. The number of people who actually manage their 529 plan investments, or proactively make changes, is little to none. They set it up and never touch it again – not a best practice of caring for your finances. It’s a challenge because these assets stay with the donor as the ultimate custodian of the account, but aren’t given the same consideration as an asset purely in that donor’s name. Mortgage repayment is shortened by 20 years and paid off in a little over nine. Accelerating payments saves you $147,395 in interest not paid. Once your mortgage is paid off, direct all mortgage payments PLUS dollars to be saved for college into an account in the parent’s name in tax sensitive investments. After four years growing at 7%, that $2,666/month = $148,000 saved in an account for college. Why do it this way? Reducing the amount of debt you carry reduces risk in your financial portfolio. You have no way of knowing if someone in your family will lose a job or income or come down with an unexpected illness. By reducing your debt risk, you’re better equipped to handle unforeseen events that can happen between now and the time your children reach college age. There is no perfect solution for every family. The cost of college is extraordinary, so it’s worth considering this option.